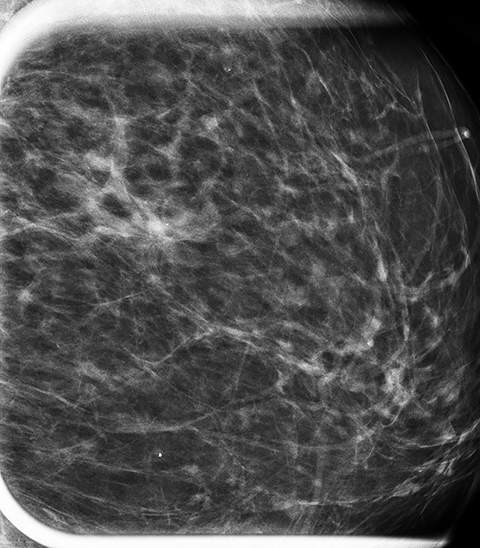 A 63-year-old African-American female presented for routine breast cancer screening. Her medical history was significant for extranodal marginal zone lymphoma, plasma cell dyscrasia and amyloidosis diagnosed one year earlier following biopsy of a right cheek mass. 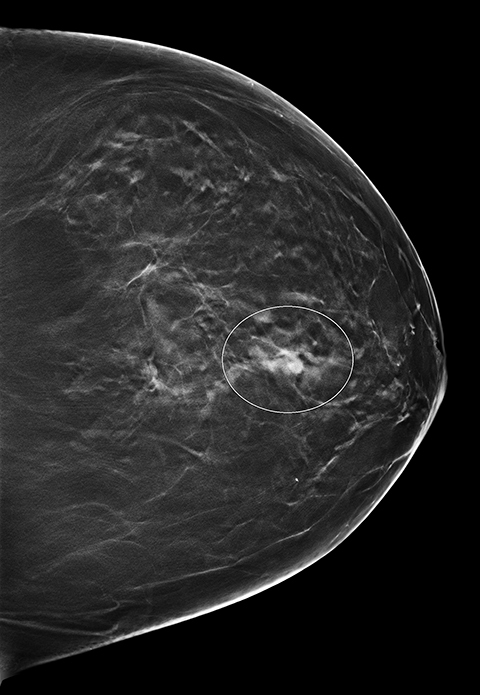 New asymmetry of the upper central/lateral left breast was found on both 2D and 3D mammography. Additional imaging was performed and the area of concern persisted on spot compression views. No sonographic correlate was found and physical exam was unremarkable. Laboratory values from the past year were significant for increased kappa light chain immunoglobulin, a finding consistent with her amyloidosis. Stereotactic biopsy was performed. Congo red histochemical staining revealed significant amorphous deposits in the interstitium and small vessels. Focal apple green birefringence was seen under polarized light. 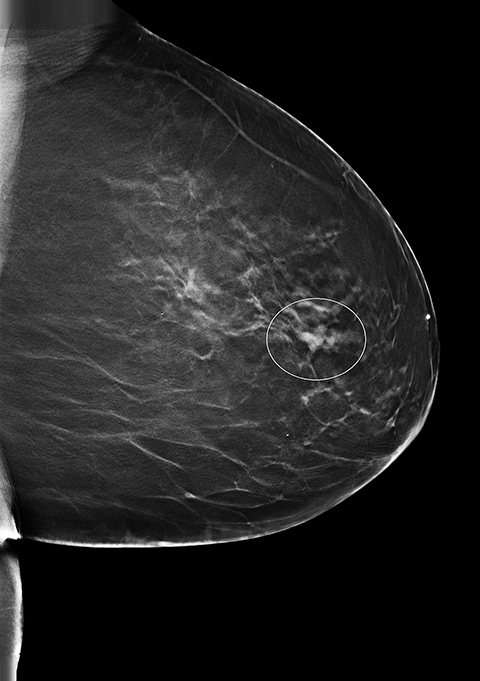 Screening 2D and 3D mammogram (breast tomosynthesis) demonstrate an asymmetry of the superior central/lateral left breast with associated calcifications (Figures 1-4). 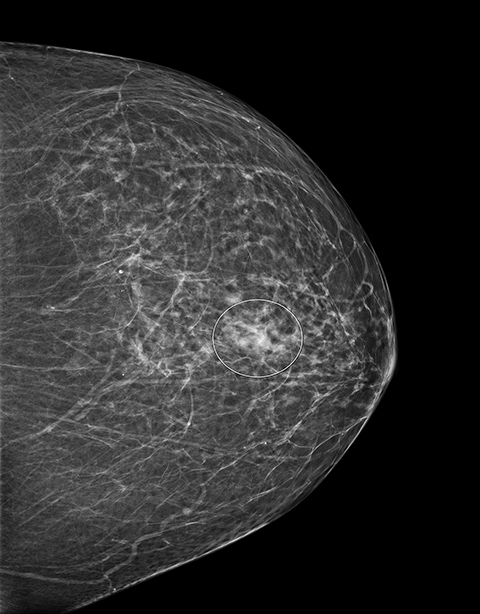 On comparison with prior mammograms, this asymmetry was new and recommended for additional imaging. Diagnostic craniocaudal and lateromedial spot magnification views (Figures 5, 6) demonstrate a persistent asymmetry with a few scattered indeterminate calcifications. The question of architectural distortion was also raised based on the appearance on spot magnification views. No sonographic correlate could be found; therefore, this new, suspicious asymmetry was recommended for a stereotactic biopsy. Breast amyloidosis, composition determined to be kappa light chain immunoglobulins. Prior to biopsy, differential included mammary carcinoma. Amyloidosis is an uncommon disorder characterized by extracellular aggregations of abnormally folded proteins. Disease onset is generally insidious with symptoms occurring as protein accumulation impinges on neighboring cells, causing cell death and tissue dysfunction. Amyloidosis of the breast is most commonly immunoglobulin light chain amyloidosis (AL) of idiopathic origin, but may result from plasma cell dyscrasia or malignancy.2,3 Lambda chain AL is more frequently found in general systemic illness, while kappa chain AL predominates in the breast.1,2,4 Many patients diagnosed with breast amyloidosis have a concurrent hematologic illness. In one study, 55 percent of breast amyloidosis patients had a hematologic disorder, most commonly extranodal marginal zone B-cell lymphoma followed by plasma cell dyscrasia.2 The patient in this case had both extranodal marginal zone lymphoma and plasma cell dyscrasia. Localized and systemic breast amyloidosis cannot be differentiated through imaging or biopsy.3 A patient without a history of systemic amyloidosis who is found to have breast amyloid deposition requires further clinical evaluation to rule out systemic illness. In summary, breast amyloidosis is an uncommon illness of the pathological deposition of misfolded proteins. It may present as a palpable mass or may only be detected during regular breast cancer screening exams, including 3D mammography. 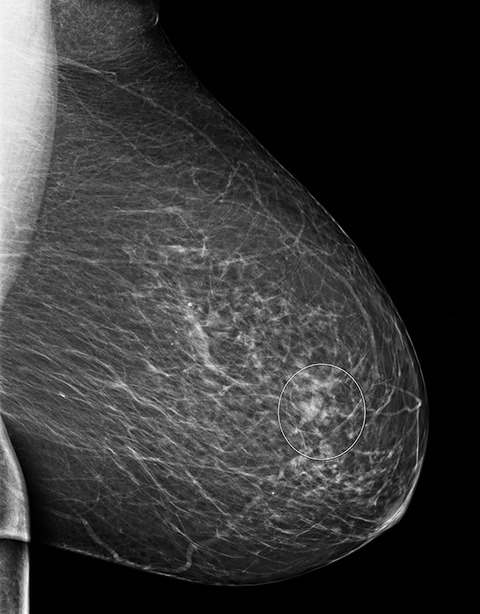 Breast amyloidosis should be included in the differential diagnosis for patients with abnormal breast findings suspicious for malignancy who have concomitant systemic immune disease, hematologic malignancy/disorder such as extranodal marginal zone lymphoma or plasma cell dyscrasia or with known systemic amyloidosis. Definitive diagnosis requires pathological confirmation via biopsy. The natural course of the disease is often benign barring the effects of systemic amyloidosis on other organ systems. Ngendahayo P, Faverly D, Herin M. Primary breast amyloidosis presenting solely as nonpalpable microcalcifications: A case report with review of the literature. Int J Surg Patho. 2012;21(2):177-180. Said SM, Reynolds C, Jiminez RE, et al. Amyloidosis of the breast: Predominantly AL type and over half have concurrent breast hematologic disorders. Mod Pathol. 2013;26:232-238. Shim Y, Kim MJ, Ryu HS, et al. Primary breast amyloidosis presenting as microcalcifications only. Korean J Radiol. 2013;14(5):723-726. Kumar V, Abbas AK, Aster JC, editors. Robbins and Cotran: Pathologic basis of disease (9th). Phildelphia: Elsevier; 2015. Charlot M, Seldin DC, O’hara C, et al. Localized amyloidosis of the breast: a case series. Amyloid. 2011;18:72-75. Hecht AH, Tan A, Chen JF. Case report: Primary systemic amyloidosis presenting as breast masses, mammographically simulating carcinoma. Clin Radiol. 1991;44:123-124. Silverman JF, Dabbs DJ, Norris HT, et al. Localized primary (AL) amyloid tumor of the breast: Cytologic, histologic, immunocytochemical and ultrastructural observations. Am J Surg Pathol. 1986;10:539-545. Powers SA, Malik A. 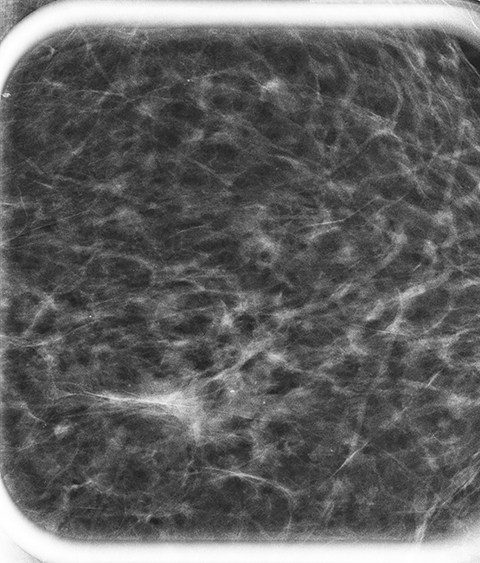 Breast amyloidosis detected with 3D mammography. Appl Radiol. 2018;47(1):37-39. Prepared by Ms. Powers while a medical and graduate student at Brody School of Medicine at East Carolina University; and Dr. Malik while a Radiologist at Eastern Radiologists, Inc. and an Affiliate Assistant Professor of Radiology at Brody School of Medicine at East Carolina University, Greenville, NC.